I have just returned from a visit to the village of Ixquisis, where community members are in peaceful resistance to the imposition of a massive hydroelectric project that threatens to divert their river and dry up their farmlands. The Human Rights Defenders Project participated as part of a caravan in solidarity with the brave people of Ixquisis. 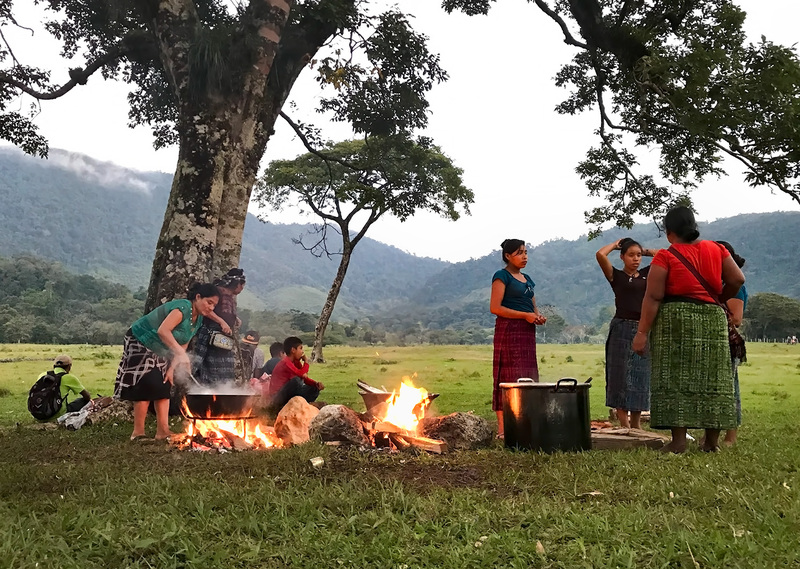 I was well-accompanied by other human rights defenders, environmental activists, community leaders, spiritual guides, artists, and indigenous authorities. Ixquisis is the very definition of remote. We were on the road (and I use that term loosely) for nearly 18 hours before reaching the village. Forging rivers, crossing mudslides, climbing rock-strewn mountains, traversing dense forest…. we finally arrived in an area so intensely green that it soothed me to my soul. All through the day we met, shared stories, and ate together in an open field. A sense of mutual support and shared struggle united those of us gathered on the grass. As night fell, I wandered far from the cooking fires, songs and dancing. In a place so free from overdevelopment and light pollution, the night sky was breathtakingly brilliant. It had been years, if not decades, since I saw a sky so iridescent with countless shimmering stars. I stood in silent awe. Maybe you’ve had that same feeling? Of belonging. Of purpose. That perfect moment when you know (not feel, not sense, but know) that you are in the right place, at the right time, doing the right thing. A prayer of gratitude slipped unbidden from my lips: thank-you. I lowered my sight to the darkness of the night and searched for the light of the cooking fires. Following the flames, and the sounds of laughter and music, I returned to my people.